By God’s hand alone, Hogan continues to minister to its surrounding community and has become an icon to the Southside of Jacksonville. 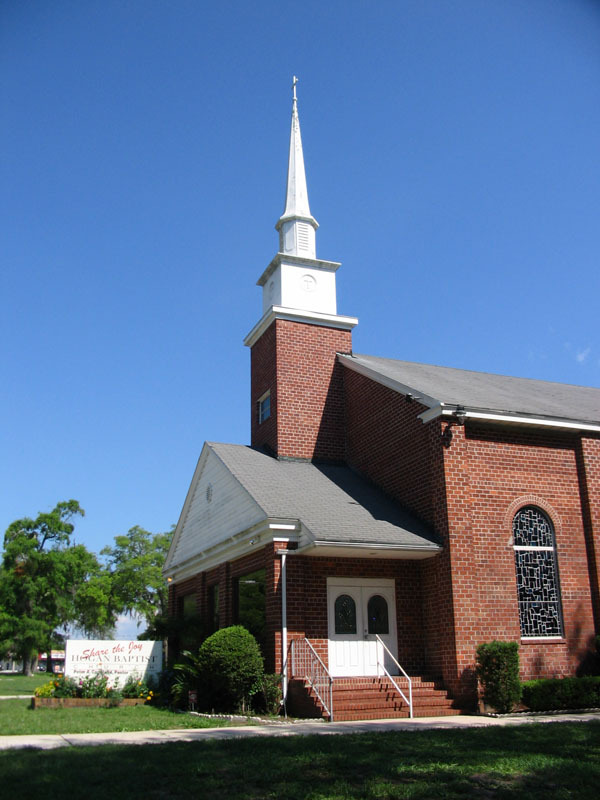 Starting in 1931, Hogan Baptist Church sought to be an assembly of believers with the simple purpose of gathering to worship the Lord. While much has changed over the years with regard to how this simple purpose is carried out, the purpose itself remains the same. Understanding however that you can not be about your business unless you know what your business is, the following has been offered to explain not only what we are about but why we are about it. While much can and should be said with regard to Doctrinal Stand, Hogan Baptist Church can in general be most easily classified as a “conservative evangelical” church with regard to our theology. There are two documents in particular that spell out the specifics of this stand. They are the “Chicago Statement on Biblical Inerrancy” and the “Chicago Statement on Biblical Hermeneutics.” Both of these statements can be easily found on the internet. Weblinks are provided for both. The Denominational Alignment of Hogan Baptist Church is with the “Southern Baptist Convention.” Doctrinally, the latest “Southern Baptist Faith and Message” reflects their doctrinal stand as well as ours. A weblink is also provided for this document. With regard to Ministerial Direction or philosophy of ministry, our purpose is profoundly simple and straightforward. Our Mission is to achieve our Vision through obedience to God’s word, fulfilling His Great Commission by making disciples (Matthew 28:19-20) who by nature strive to obey God’s Great Commandment. Our Core Ideology which explains “Why this vision,” outlines our chief motivation and guiding force. We believe that God’s word is truth in its entirety. We also believe that it is universally authoritative and binding to all of humanity. God’s word clearly states, both explicitly and implicitly, that He has special expectations of those He has entrusted with His specially endowed gifts and talents. God’s word also establishes our accountability to Him and a special eventual appointment were we will give such an accounting to Him alone regarding all that He has made us stewards over. We therefore should pursue our God given responsibilities individually as believers and collectively as God’s church with a real sense of zeal and urgency equipping the saints for the work of the ministry and striving toward the fulfillment of the commission God has given us in harmony, unity and efficiency. Emphasis on the intentional establishing and cultivation of long term Christ centered relationships. Move individuals from a mindset of spectator to involvement, dependence to independence, consumer to producer. Establish for the new convert, an expectation of independent and productive ministry involvement and spiritual growth. Provide consistent and solid opportunities for worship, discipleship, evangelism, ministry, and fellowship. Mentoring and shadowing the convert / new member in their involvement in ministry and spiritual growth.